Know what you're buying, before you open your wallet. Microsoft has cleared up the mystery about what processors are inside the new Surface Book and Surface Pro 4, and here’s the answer: The high-end Surface Pro 4 contains a dual-core Core i7 Skylake chip, while the Surface Book uses a faster, also dual-core, version. Specifically, the high-end “clipboard” tablet portion of the Surface Book uses a dual-core Intel Core i7-6600U chip with Intel’s HD Graphics 520 integrated GPU inside, Microsoft confirmed. 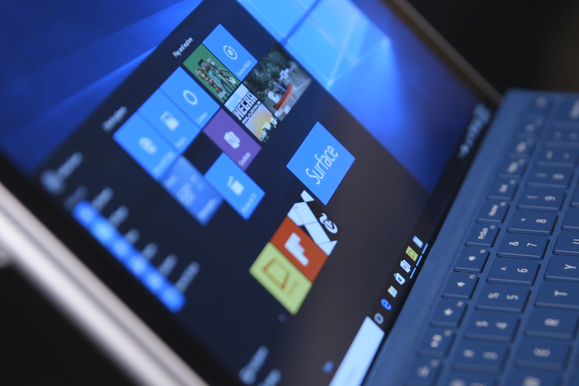 The premium version of the Surface Pro 4 uses a Core i7-6650U with Intel’s premium graphics, the Intel Iris 540. Microsoft also confirmed some details of the GPU inside the base of the Surface Book. “[The] Surface Book with the optional discrete GPU uses a custom Nvidia GeForce GPU designed for Surface Book and based on the Maxwell architecture. 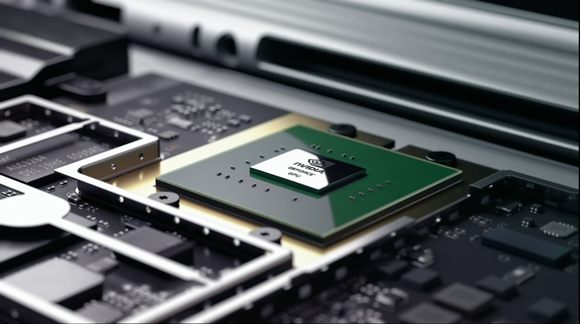 Featuring 1GB GDDR5 high-speed memory, it was customized to deliver accelerated graphics performance within Surface Book’s versatile form factor,” Microsoft said in a statement. Microsoft also revealed which processors are used in the other versions of the Surface Book and Surface Pro 4, but not the clock speeds. Why this matters: You could be paying $2,699 for the premium version of the Surface Book. So, is it worth it? Much of the confusion was caused during Tuesday’s unveiling of the Surface Book, when Microsoft’s corporate vice president for Surface Computing Panos Panay said that “by adding the discrete GPU, two extra processors, it fundamentally makes Surface Book two times faster than the MacBook Pro.” That had a lot of folks wondering if Microsoft hadn’t somehow magically jammed a quad-core CPU into the thin tablet body of the Surface Book. What CPU is inside the Surface Book? We now know. Here’s what Microsoft told PCWorld on Friday about the specs of each Surface Book and each Surface Pro 4. The sixth-generation chips refer to the ”Skylake” processors that we reviewed earlier, at least on the desktop. Microsoft hasn’t confirmed the clock speeds, but Intel’s own spec sheets tell us what they are. Intel has a comparison chart of the two chips on its site. You can compare these three chips on Intel’s site, here. Which Surface Book to buy: Core i5 or Core i7? With identical graphics cores, the main difference between the Core i5 and the Core i7 appears to just be pure clock speed, so the better deal for performance per buck goes to the Core i5 chip. Sometimes Intel turns features on or off based on where it wants the chip to fall in its performance hierarchy. For example, some Core i7 chips may contain its vPro technology, while some Core i5 CPUs may not. With the Surface Book, both CPU models will support vPro which enables manageability in a corporate IT environment. Therefore, you’d probably be fine buying the Core i5 version of the Surface Book with discrete graphics and 256GB SSD for $1,900 instead of shelling out $2,100 for the Core i7 Surface Book with discrete graphics and a 256GB SSD. Most of you won’t notice the difference unless there’s some other key difference between the configurations that I’m missing. 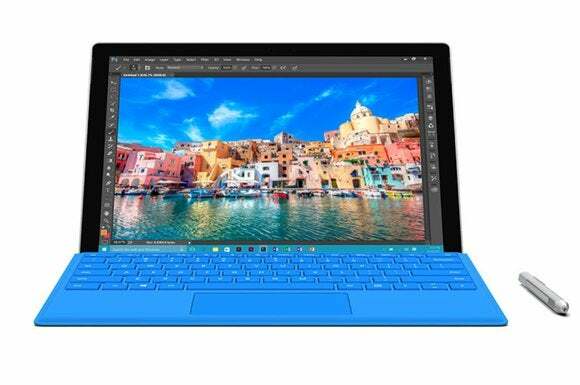 What about the CPUs in the Surface Pro 4? Unlike the Surface Book, here you should choose wisely. While the CPUs in the Surface Book don’t differ dramatically, the SP4’s brains matter far more. Your CPU choice on a new Surface Pro 4 will matter more than on the Surface Book. The highest end Surface Pro 4 uses Intel’s Iris Graphics with 48 execution units and should offer rather decent performance. If you read page 4 of my Skylake Core i7-6700K review, you’ll see that the desktop chip with its Intel HD 530 graphics—a step down from the Surface Pro 4 with the Core i7—pushes 54 fps in Tomb Raider when set to normal and at 1366x768 resolution. I don’t think it’s unreasonable to expect the Surface Pro 4 to be close to that or possibly exceed it (there are differences in cooling and memory bandwidth that could impact performance). Basically, “light-duty” gaming is definitely a feature of the Core i7 Surface Pro 4. The mid-range Core i5-based Surface Pro 4 will be slower, but in the same performance ballpark as the Core i7 unit in, say, Photoshop. 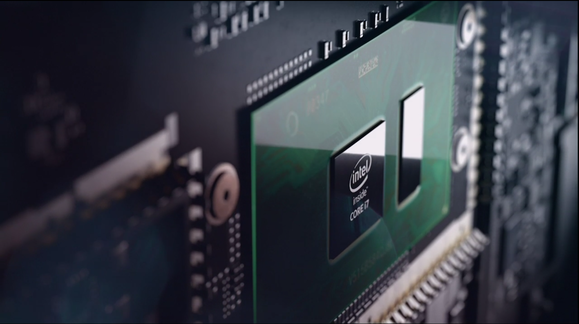 But it will take a definite back seat in graphics performance, which means “lighter duty gaming” or graphics tasks. The really interesting changeup is that Core m3-6Y30 part within the entry-level Surface Pro 4. It won’t be as fast as the two faster SP4’s in any CPU task, such as Photoshop or video encoding, and it’ll also be third-place in graphics, too. But the significantly lower power consumption—and the significant boost in battery life—may be worth the tradeoff. Depending on how Microsoft configured the chip to run in the Surface Pro 4, it could offer truly stupendous battery life that the two hotter and faster CPUs can’t touch. And it’ll do this while offering better performance than say, an Atom X5- or Atom X7-based Surface 3. With this information in hand, the sweet spot for performance for the pre-configured models is the Core i5 with 8GB of RAM and the 256GB SSD. But that puts you into the $1,430 price range, however, which is pretty painful. Unfortunately, Microsoft’s “customize” button is no help, as it just walks you through the increasingly expensive Surface Pro 4 units. The basic specs of the Surface Pro 4 are the same, including its 12.3-inch display with a crisp resolution of 2736x1824 pixels. Picking the Core m3 version, for example, doesn’t yield any actual options. Ideally, if you’re just a regular user and don’t drive Photoshop all day, you should be able to buy a Core m3 SP4 with 8GB of RAM and 128GB of RAM. But you can’t. Likewise, the options for the Core i5 version only let you pay for more storage or more RAM. For someone more sensitive to performance and price, it would be nice to get a Core i5-based Surface Pro 4 with 8GB of RAM and 128GB SSD. To be fair, I have used a Dell XPS13 for a few months with “just” 4GB of RAM for general computing, including a bit of Photoshop, and it was fine thanks to the SSD. Still, there were a few occasions where I wished I had 8GB of RAM. Buy the Core m3 SP4 if your top priority is battery life, cost and more performance than an Atom-based Surface 3. Just know it will be slower in graphics and CPU tasks than the other two units. One thing to be aware of: the Core m3 does not have vPro, which may be a deal-breaker for a managed corporate environment. Buy the Core i5 SP4 if you do more intensive chores such as Photoshop, Lightroom or light-duty video editing. The extra 8GB will help, and the Core i5 should outpace the Core m3 in CPU tasks and be a little faster in graphics tasks. And yes, vPro is supported on the Core i5 version. Buy the Core i7 SP4 if you really need faster graphics performance. On the CPU side, you may see a 15 percent or so performance difference, too. Again, this is based on how Intel CPUs have behaved for a few generations now and my testing of the desktop Skylake chips. While we won’t know for certain until we perform actual testing, I’m pretty comfortable making these predictions now. 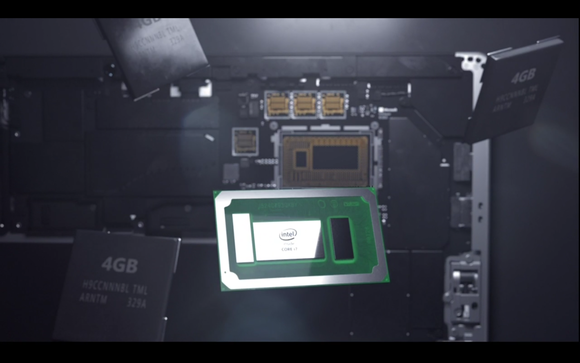 All we know about the graphics chip is its an Nvidia Maxwell-based graphics chip. Even this shot says nothing about the model. But what about that graphics chip? One part that’s still shrouded in mystery is the discrete graphics chip Microsoft put in the Surface Book. Microsoft blew people’s socks off with the Surface Book and the fact that it basically put external graphics into one part of its detachable computer that doesn’t require a reboot when you swap between them. What GPU though, I still don’t know. Nvidia offered up nearly the same statement as Microsoft itself did. The company directed me to Nvidia’s blog, which confirms that it’s an “8M” and has a 1GB GDDR5 frame buffer. So for that one chip, you’ll have to wait a bit more to find out just what kind of performance the Nvidia GPU nets you. Preordering is always a bit risky, especially with a somewhat radical new architecture like the Surface Book. But the picture is now much more clear than it was before. Just be sure and pick what’s right for you. Additional reporting by Mark Hachman.